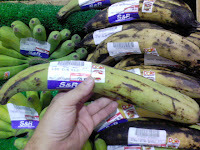 Last week while I was at the supermarket, I couldn't help but notice the unusual bananas in the fresh food section. I'm used to seeing bananas around 2 to 4 inches long. But this particular banana is HUGE ! 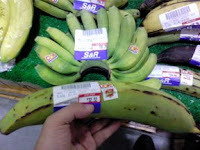 When I mean huge, I mean that this banana can pass for an egglant or a cucumber if it were much greener. 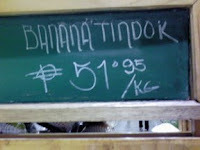 The sign above said "banana tindok". It's the first time I've heard of this type of banana. It's like 9 to 12 inches long. The one I held was even longer than the entire bunch of smaller bananas. Call me ignorant about the "banana tindok" or not. I just thought it was worth sharing. I definitely got a shock from the sheer size. I wish there were pickles this huge too.